Executives at Universal Pictures have picked up the rights to Blonde Ambition, which held the number one spot on last year's (16) Black List - a countdown of the film industry's best unproduced screenplays. The movie was written by Elyse Hollander and the story will be set in 1980s New York. It will focus on the pop sensation's rise to fame. It is unclear when the movie will go into production, but the Material Girl singer is not throwing her support behind the project. "Nobody knows what I know and what I have seen," she writes on Instagram. "Only I can tell my story. Anyone else who tries is a charlatan and a fool. Looking for instant gratification without doing the work. This is a disease in our society." 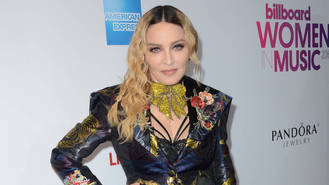 According to The Hollywood Reporter, the biopic will centre upon the difficulties the singer faced while pursuing a career in a sexist industry and will chronicle the creation of the hitmaker's groundbreaking first album, Madonna, which was released in 1983. The film will also recreate the megastar's iconic performance of Like A Virgin at the very first MTV Video Music Awards in 1984. Blonde Ambition is Hollander's debut screenplay. She previously worked as an assistant to Birdman filmmaker Alejandro Gonzalez Inarritu. Blonde Ambition was also the title of Madonna's 1990 world tour, which she launched following the release of the album Like A Prayer. The controversial tour was chronicled in the behind-the-scenes 1991 documentary Truth or Dare.